Trichinella spiralis is an intracellular parasite with a direct life-cycle. Adult worms (AW) dwell in the small intestine of flesh-eating animals and ML in muscles of the same hosts. After infected meat is ingested, ML are liberated in the stomach and develop into intestinal L1 larvae (IL1) in the intestine at 0.9 h post-infection (hpi). 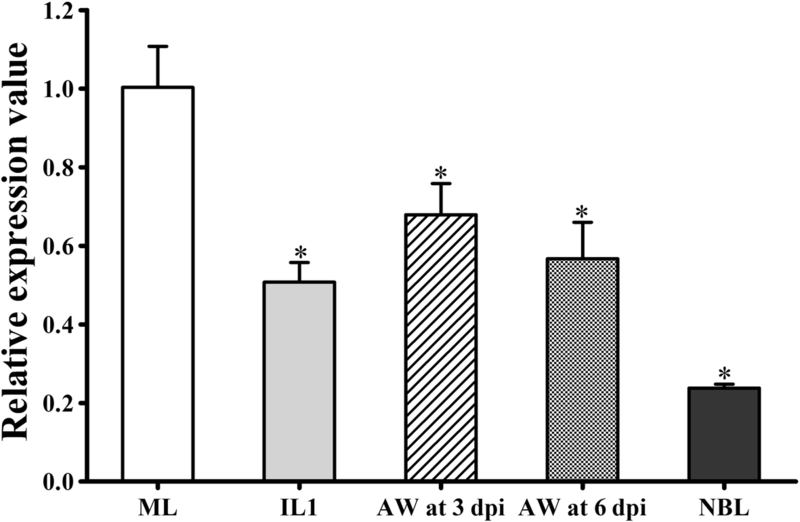 The IL1 penetrate into the enteral epithelium where they molt four times and grow into AW [10, 11]. 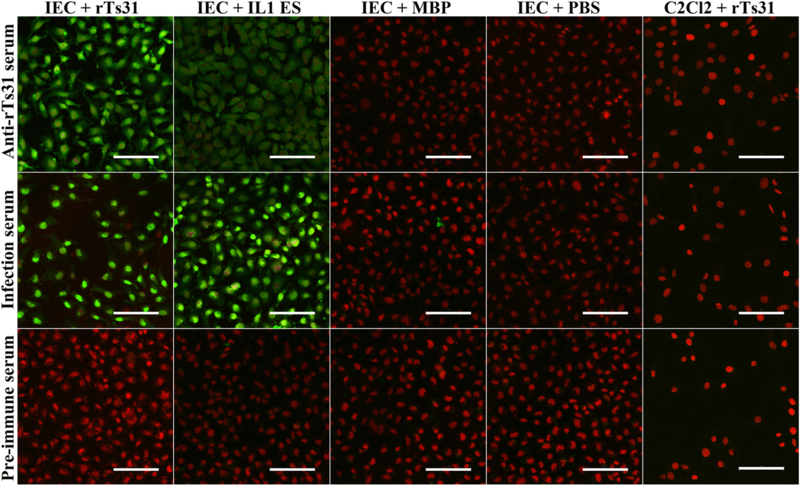 IL1 invasion of intestinal epithelium cells (IECs) is crucial for the establishment of Trichinella infection, whereas the intestinal epithelium is the first host’s native innate barrier combating Trichinella infection and the principal location for the interaction between the intestinal nematode and the host [12, 13]. If the IL1 invasion of IECs, larval development and newborn larvae (NBL) deposition are interrupted, or IL1, AW and NBL are expelled from the intestine by vaccination, Trichinella infection will be prevented or eliminated in the early stage of enteral infection [14, 15]. Therefore, development of an anti-Trichinella vaccine is necessary for the control and elimination of porcine Trichinella infection to ensure pork safety [16, 17, 18]. 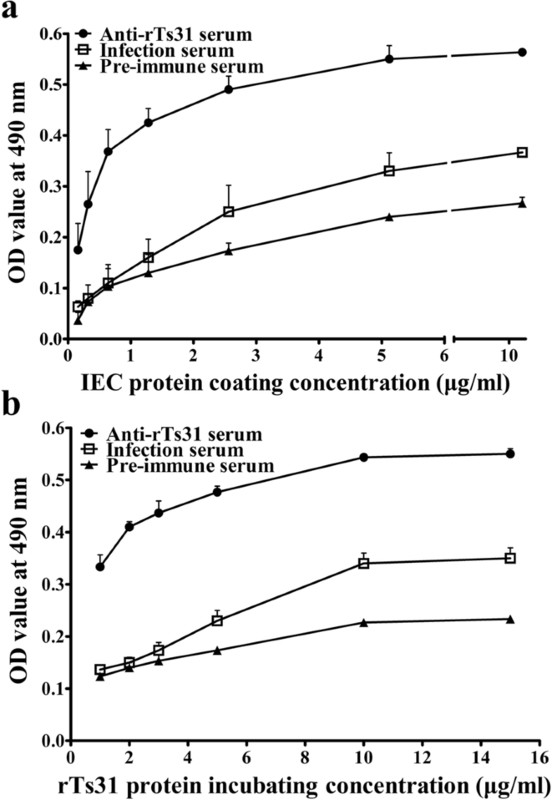 Trichinella spiralis excretory/secretory (ES) antigens are exposed to the host immune system and play a significant role in regulating host immune responses and parasitism . By proteomics analysis some serine proteases have been identified in T. spiralis larva ES proteins [20, 21]. 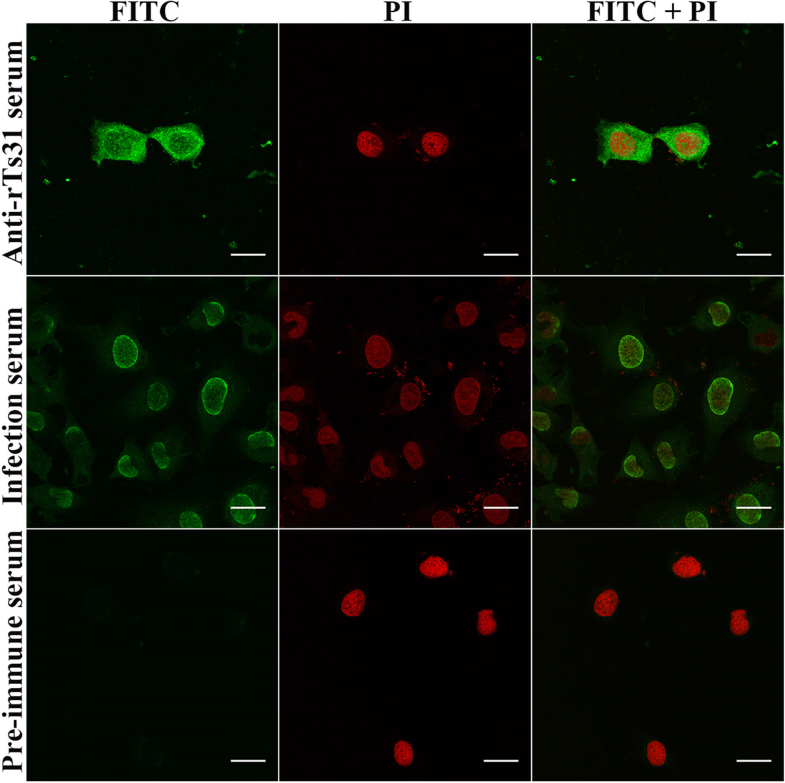 Serine proteases secreted by parasite might have a crucial role in the modulation of host-parasite interactions, for example mediating or facilitating invasion, taking nutrition, or evading the host’s immune responses [22, 23, 24]. Serine proteases could be potential vaccine target molecules against T. spiralis infection. In the present study, Ts31 was expressed in E. coli. qPCR results revealed that Ts31 mRNA was transcribed at all T. spiralis stages (ML, IL1, AW and NBL) and the Ts31 transcriptional level at the ML stage was significantly higher than that of the other stages, which might be related with worm age and their different living environments. For example, the AWs lodge in the host’s intestine and persist for 10–20 days in mice and rats or 4–6 weeks in humans whereas the ML parasitize in the host’s skeletal muscle for 1–2 years, or even up to 10–15 years without any major harm . Ts31 was primarily distributed at the cuticle and stichosome (secretory organ) of the nematode, suggesting that Ts31 is an ES protein. 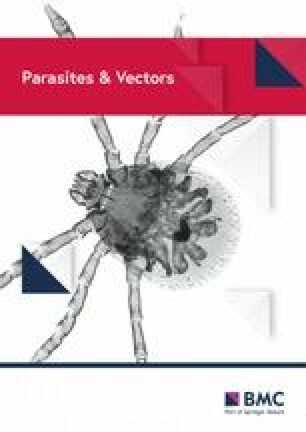 The results are consistent with the fact that Ts31 was identified in ES proteins of T. spiralis ML, IL1 and AW [26, 27, 28], and the ES proteins principally derived from the shed cuticle proteins and stichosome secretory granules of this parasite [26, 32, 63]. This characteristic of Ts31 is similar to other T. spiralis serine proteases TsSerP and TspSP1.2 [23, 24]. 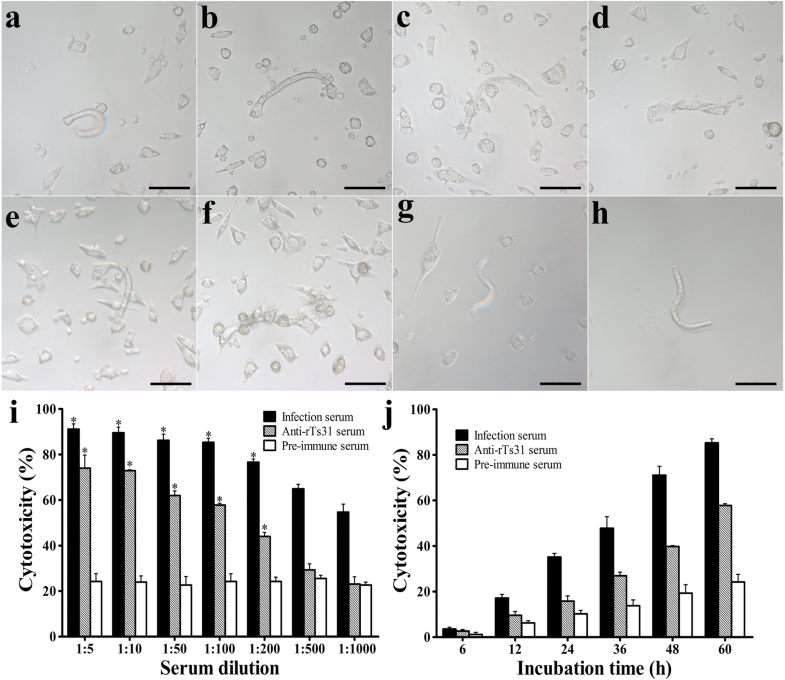 Trichinella spiralis serine proteases might have housekeeping functions and might be an indispensable protease in larval invasion, development and survival in the host. Additionally, sequence analysis shows that the Ts31 contains a domain of trypsin-like serine protease . rTs31 was found to have no serine protease activity, as determined through gelatin zymography (data not shown). 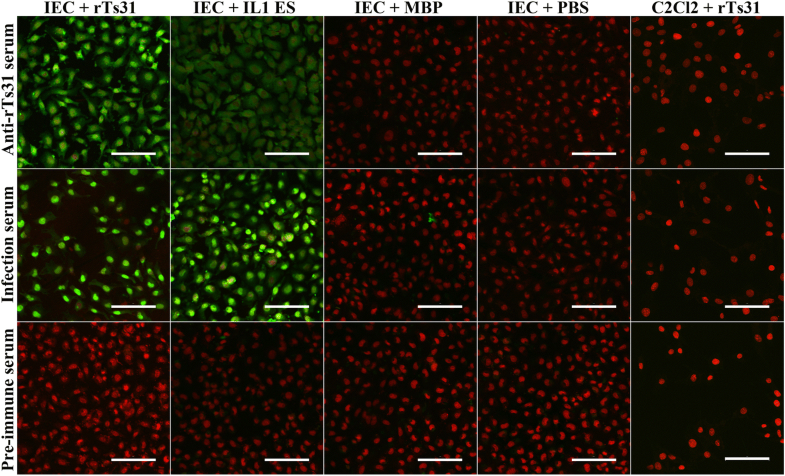 The inactivity as a serine protease for the rTs31 in this study may result from the improper folding expressed in prokaryotic cells. Further expression of rTs31 in a eukaryotic expression system such as in yeast or mammalian cells needs to be conducted. Trichinella spiralis is a multicellular parasitic nematode and has a complicated antigenicity and life-cycle. 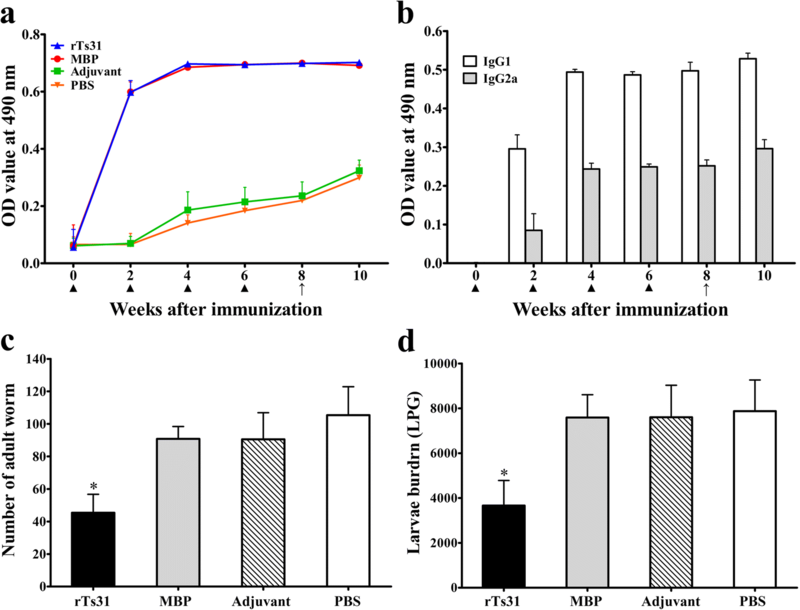 Vaccination of mice with a single recombinant Trichinella protein only elicited a partial protection against larval challenge. Thus, multi-epitope vaccines against various T. spiralis stage worms should be explored [14, 16, 72]. Since the protein antigenicity in the stomach will be reduced significantly , oral vaccination with Ts31 DNA vaccine is likely to be a more suitable vaccination strategy to elicit long-term intestinal mucosal immune responses against the early invasive worms during enteral Trichinella infection [74, 75, 76, 77], based on the route of Trichinella infection (eating raw or undercooked meat). Therefore, oral polyvalent anti-Trichinella vaccines should be developed in future study.